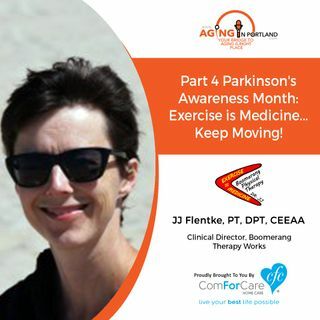 5/5/18: JJ Flentke, PT, DPT, CEEAA with Boomerang Therapy Works | Part 4 Parkinson's Awareness Month: Exercise is Medicine...Keep Moving! JJ Fletke, PT, DPT, CEEAA, highlights the expertise in treating the aging population, especially those with Parkinson's, MS, stroke, and brain injuries. We want our patients to be inspired by the care they receive and to be hopeful about their potential to stay healthy. We promote exercise as a healing process. We are dedicated to providing safe, appropriate, challenging exercise, as well as challenging the brain. Because of its neuroplasticity, it can heal too!